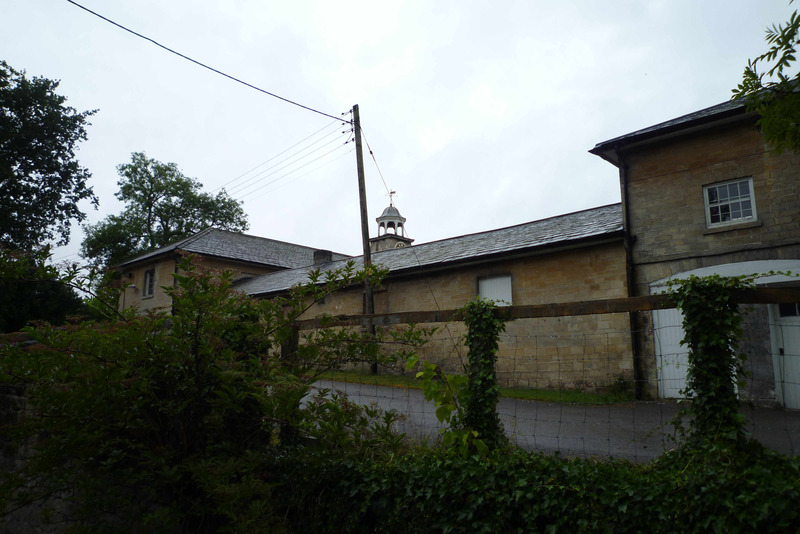 We had the quietest night at Osberton Lock but were woken by the sound of heavy rain drumming on the roof. We got moving very slowly – reluctant to be out in the weather – we’ve had a largely dry, though sometimes chilly, odyssey so far. 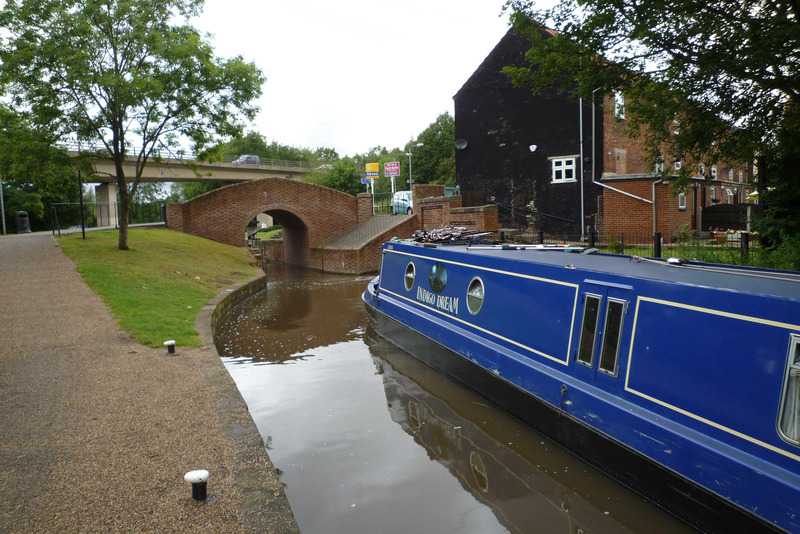 Nonetheless, we had to move on – we had another epic cruise planned and we were picking up Sarah, Andy and five of their hounds for an exploration of the final navigable stretch of this part of the Chesterfield Canal. I got onto the helm, locked the hounds inside (Lynx was keen to be on deck!) 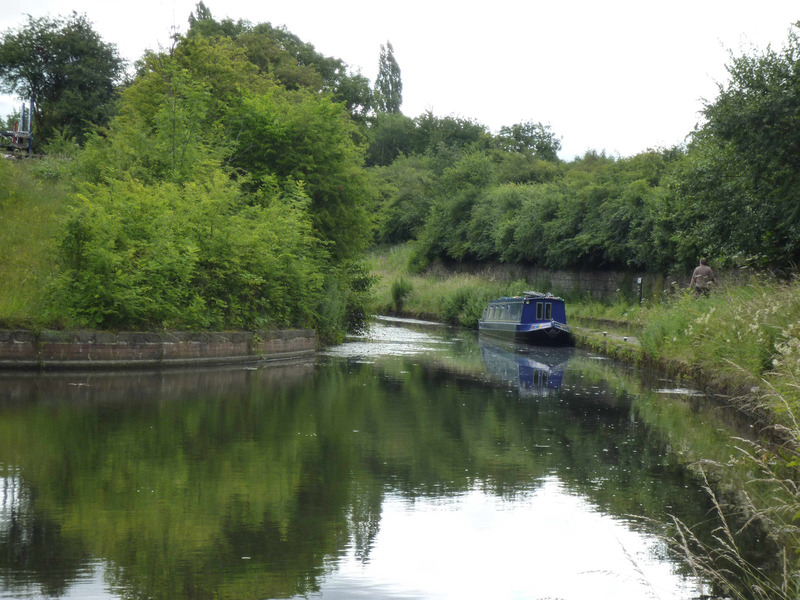 and set off down the canal. Richard, in the meantime, took the car to High Hoe road bridge and would cycle back to meet me. He was a tiny bit smug as he set off in his warm, dry car and I set off on the exposed helm but he was to get soaked later – not so much from the falling rain as from the thick vegetation brushing against him as he cycled back! I enjoyed the next stretch, despite the rain – it’s wooded and shady at first and Osberton Hall with its associated wooden bridge (made from old railway sleepers) is an interesting landmark. The canal here is still rural but arguably more ‘garden’ than ‘farm’. I soon got to Bridge 46 – I can’t blame nb Algonquin for mooring there, but when I saw the round patches of burnt grass on the towpath I couldn’t blame them for moving on either. From Bridge 46 onwards, Worksop starts to make its presence felt, with more trash in the water and evidence of petty vandalism; I passed two BW workboats – inconveniently brested up and flanked by their equipment which had been chucked into the canal – fencing, wheelbarrows and the like, further narrowing the canal to a scant boat-width. Richard helped me through Kilton lock – this has fearsome anti-vandal locks – the anti-vandal locks are themselves protected by steel shrouds which have to be removed after you awkwardly reach inside to undo a padlock – we found out later that this was to prevent fish theft – this pound is apparently a regular target. 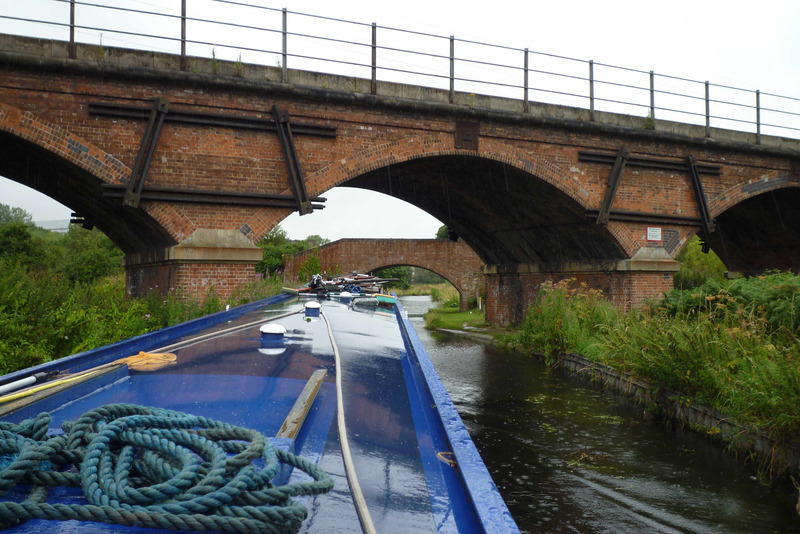 I moored up below the next lock – Bracebridge, while Richard went off to pick up our guests. Sarah and Andy had spent the week traversing the country in their motorhome and they’d parked up in Shireoaks marina (secure parking for BW keyholders). 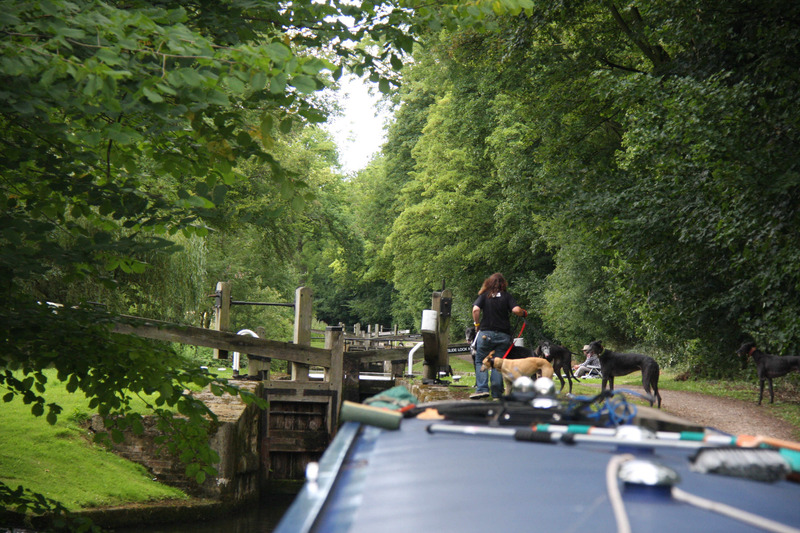 Richard went to collect the two humans and five hounds (Susie, Ranger, Sid, Henry and Archie) while I stayed with the boat and set the lock. 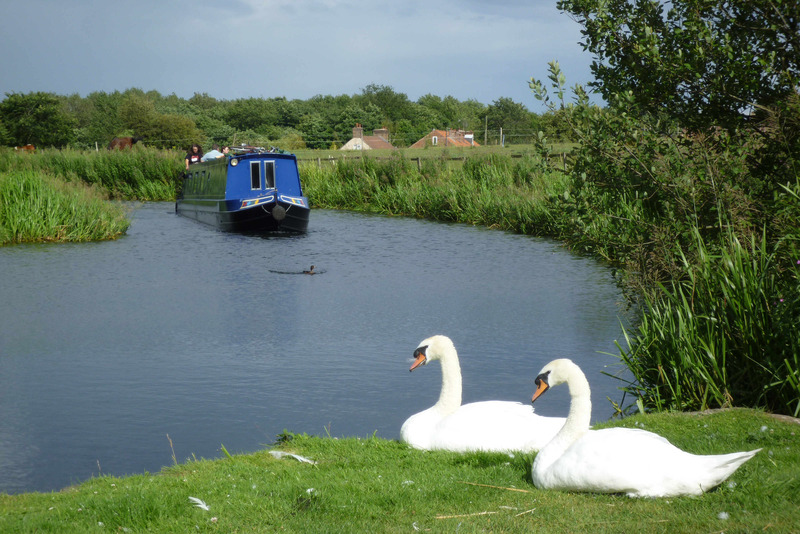 I wasn’t worried about inconveniencing other boats – there simply weren’t any – all day!!! The pack soon returned and I took Lou, Lynx and Ty for an introduction on neutral territory. It was a red-letter day, Sarah had brought top-girl Susie, and though she’s met top-girl Lou before, this was the first time they’d be spending time in close proximity. Their initial meeting was bad, but completely as predicted, the two girls barked savagely at each other, leaving each other in no doubt as to what would happen if they were off-lead and unmuzzled – oh dear. Two minutes of walking in the same direction, it was all over and they settled down for a peaceful day – they even shared the sofa for a while! There were a few growls between the pack members as the day wore on but they were invariably caused by someone quite literally treading on someone else’s toes – we’ve had to reluctantly conclude that eight probably is the maximum number of greyhounds that we can fit on the back deck – though there’s plenty of cabin space for them inside. With the pack on board, and coffees made, we set off through Worksop. Sarah’s family hails from this area so she has fragments of family memory which were awakened as we passed different pubs and other landmarks. She and Andy have a good attitude with young people and rather than attracting trouble they managed to recruit help. 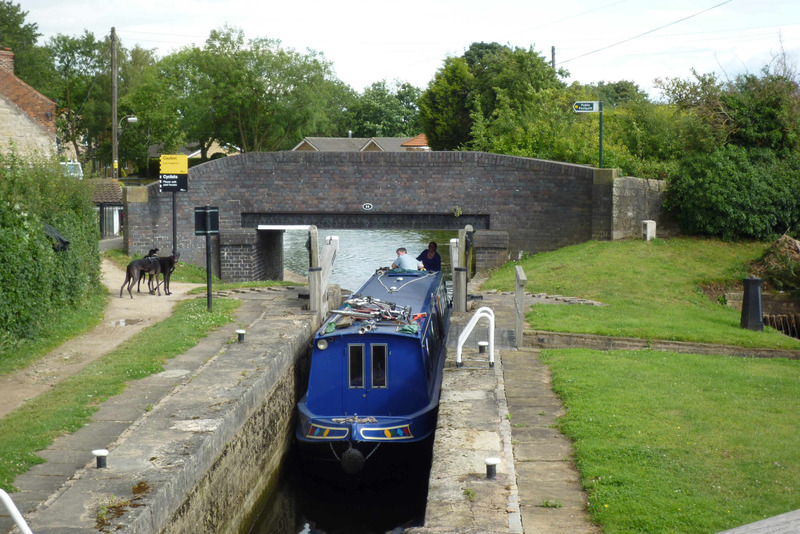 Young men who we would have considered to be ruffians meekly opened and closed lock gates under Sarah’s unflinching direction – it’s is a special talent! 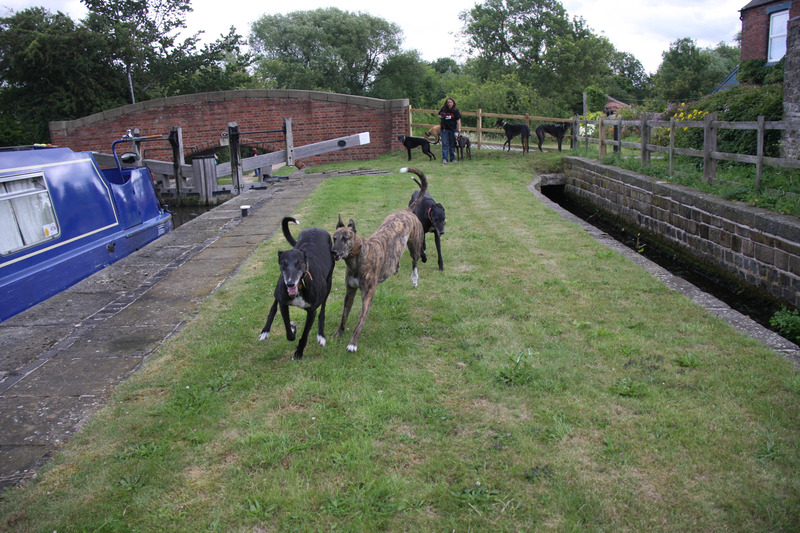 Because so few boats move along this canal, the sight on Indigo Dream approaching Town lock was a spectacle – the sight of Indigo Dream with seven greyhounds on deck was a revelation – add to that the dramatic rescue of a duck from the lock and it’s a wonder they didn’t call the local paper! As you may have gathered, we had quite an audience, with people equally fascinated by boats and hounds. Eight hounds having a good time - on a well-fenced lock island! Now there are narrow locks and there are narrow locks – these are very narrow indeed – we got the hint when a few pencil fenders got ripped off (luckily we recovered them all). We tried to lift them, especially for Stret lock. We’d been warned that subsidence had made the lock narrow and that some boats couldn’t pass – including nb Algonquin whom we met last night. As it happened, we got through Stret Lock with no problem but we got a bit wedged when we tried to get into Deep lock (just above Stret lock). 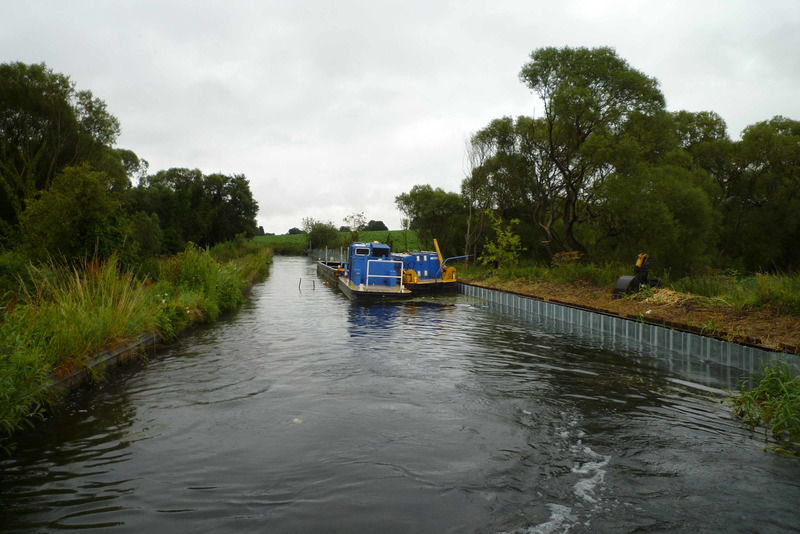 Luckily we weren’t totally stuck – we reversed back, removed our towpath side fenders, still got wedged so with some effort, removed the last of the fenders on the non-tow path side – I then inched Indigo Dream into the lock and we were on our way again. By this time, the rain had stopped and the afternoon was shaping into something very special indeed…. 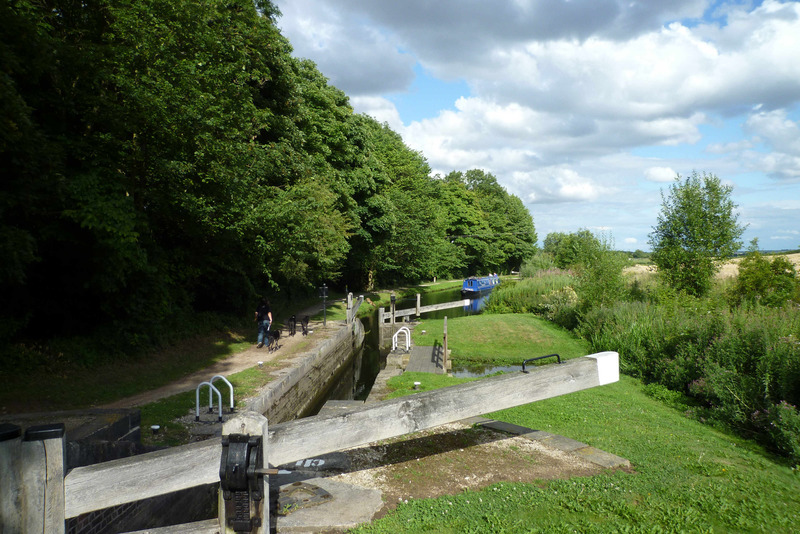 It’s locks all the way from Worksop – the somewhat dispiriting town is replaced by stunning countryside alternating between sylvan shades and expansive cornfields. 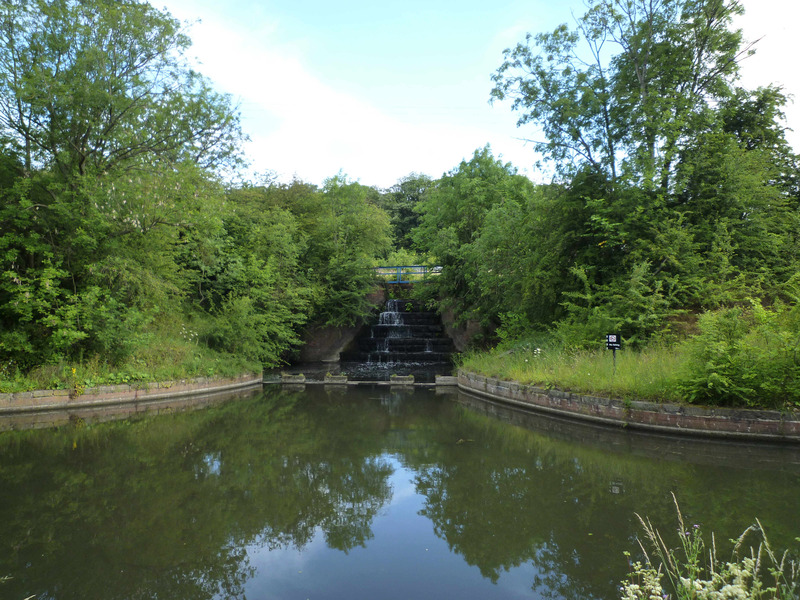 The wooded sections are lushly green – “like the amazon” said one, “more like middle earth” said another – whichever analogy you choose the Chesterfield canal is a place where time and space certainly lose all meaning. 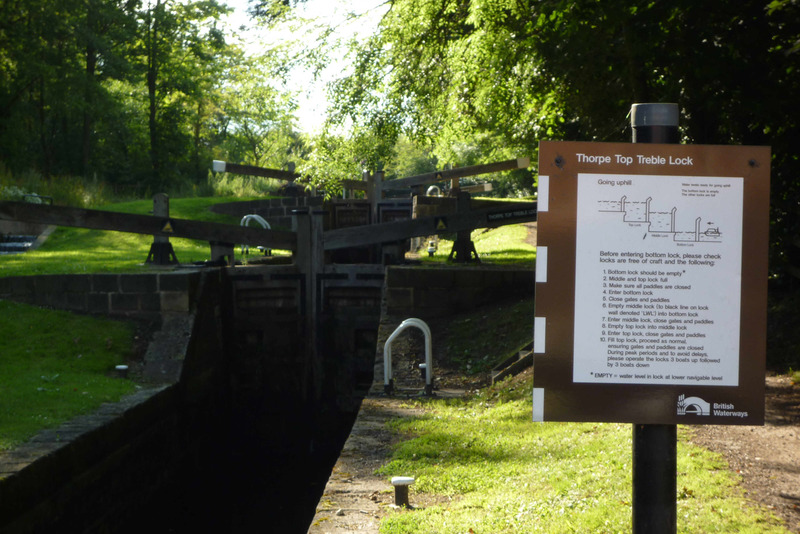 Apart from the little village of Turnerwood, which has 2-hour visitor moorings, the locks are silent and isolated. 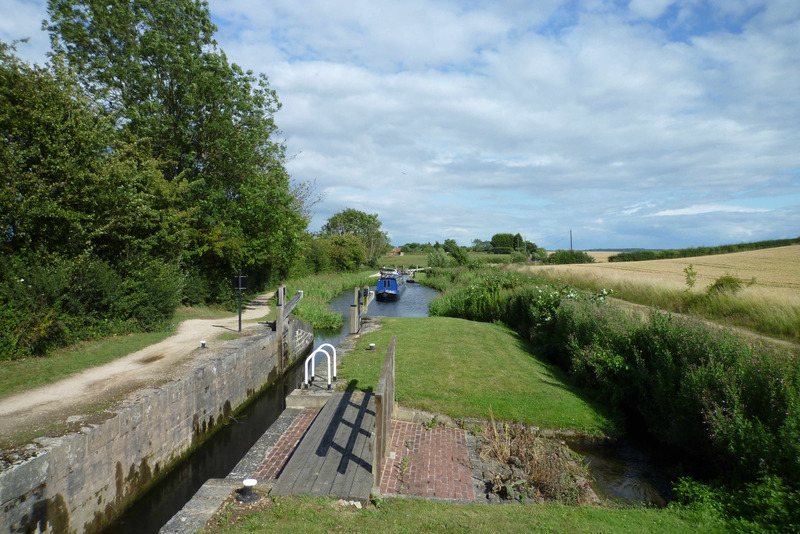 This was perfect territory for the hounds, who could have a bit of off-lead rummaging time – especially where the locks had fenced offside ‘islands’ created by the bywashes. 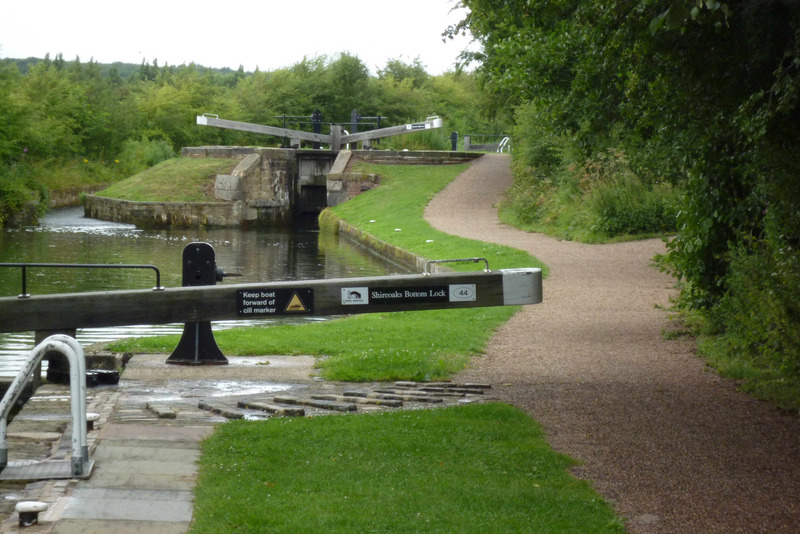 The locks themselves are an interesting mix of singles, double and triple staircases – absolutely marvellous. After an afternoon’s very enjoyable toil we reached the summit and Richard cycled back down to get the car – some four miles and 33 locks away! In the meantime Sarah and I were tasked with finding an overnight mooring. Although it was late now and the entire crew was weary, we still enjoyed the deeply shaded canal, rich with the smell of wild garlic. 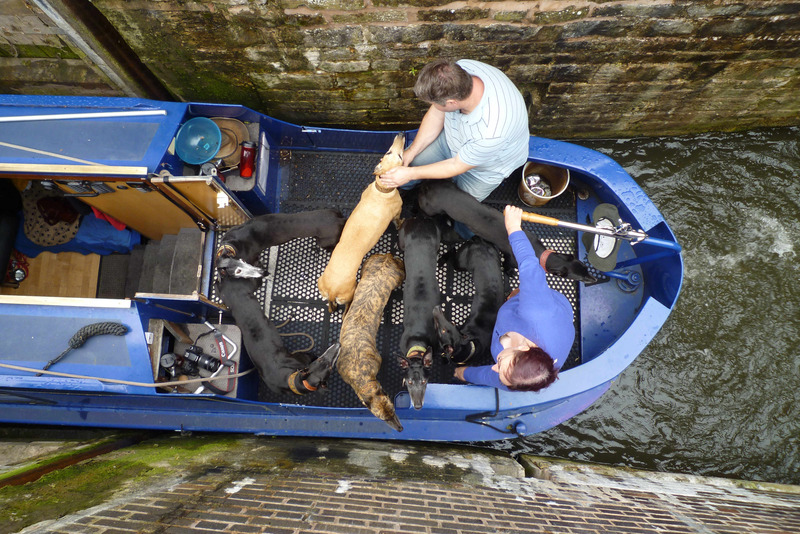 We tried pulling in at Albert Dock but the wall was a little high for our hounds and we couldn’t get the boat right into the bank so we took a chance and moved on. 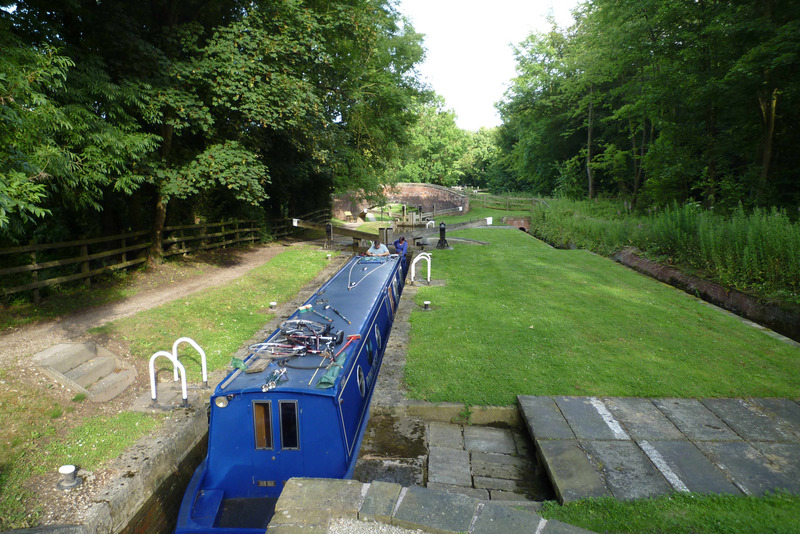 I’m so glad that we did – just before the winding hole that marks the limit of the navigation there is a fine mooring platform with bollards – all at just the right height for hounds. We moored up and once the engine was off it was totally silent, though we were within five minutes walk of Kiveton Park train station. Andy and Sarah walked the hounds while I sorted the boat. Richard soon rejoined us and we had a fun car trip back to Shireoaks Marina with Susie, Sid and Archie comfortably laid out in the boot and me, Sarah, Ranger and Henry squashed into the back seat! We dropped the hounds off in the motorhome (we’d obviously left ours on board) and set off to find a pub for a celebratory/commiseratory meal – we’d reached the turning point of this year’s odyssey. We drove to the Parish Oven in Thorpe Salvin – it’s a nice place which obviously specialises in entertainment, however it stopped serving food at an improbable 8.30pm so we moved on. A local recommended the Red Lion in Todwick – they serve food until 10pm and we had a fine meal here. Replete, we dropped Sarah and Andy back at the marina and we headed back to the boat – the mooring was very quiet indeed and Ty was almost happy here – that made us happy too! We slept well on our moorings and were up quite early (by our standards) – we took the hounds for a walk to the very end of the navigation – the overgrown portal of Norwood Tunnel. 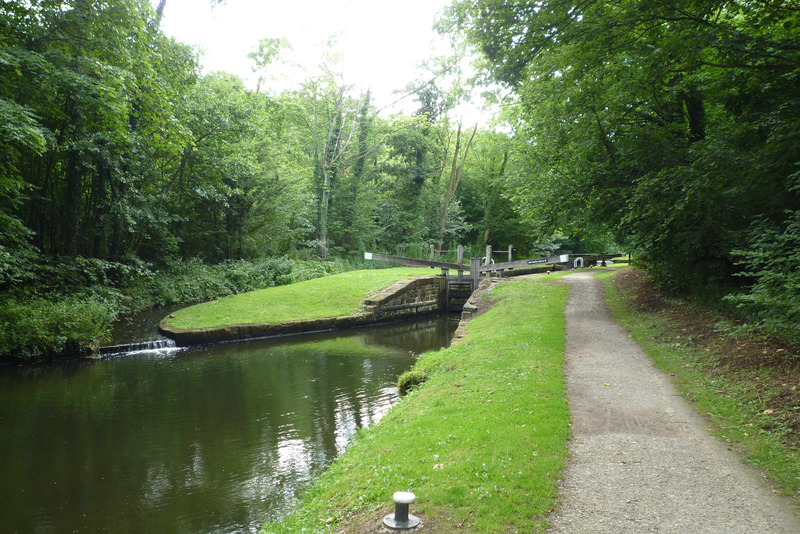 The tunnel was closed by subsidence in the early 1900’s and has been a major barrier to the canal’s complete restoration. If you come this way, DO NOT take your boat to the winding hole at the tunnel portal marked on the Nicholson’s – there isn’t one! 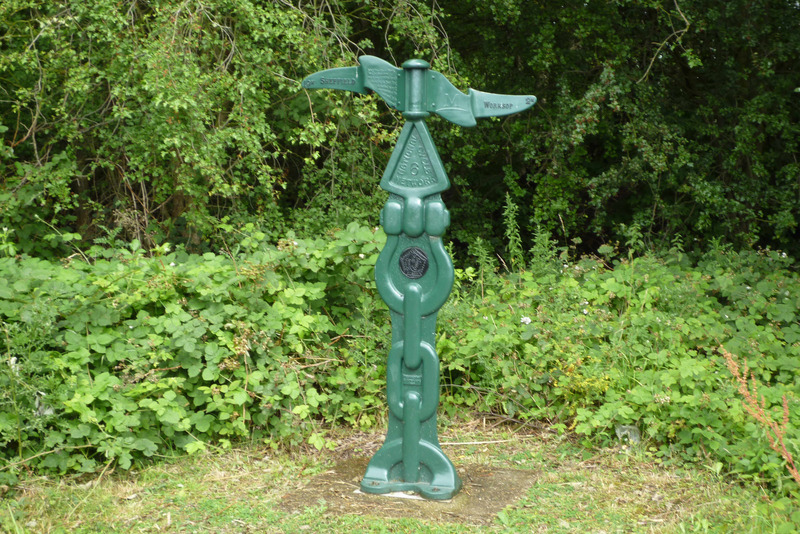 Stop and wind where the BW signs tell you to – just beyond the mooring platform. There are fields beyond the portal (which is set well below the towpath) where we could let the hounds have a little run. 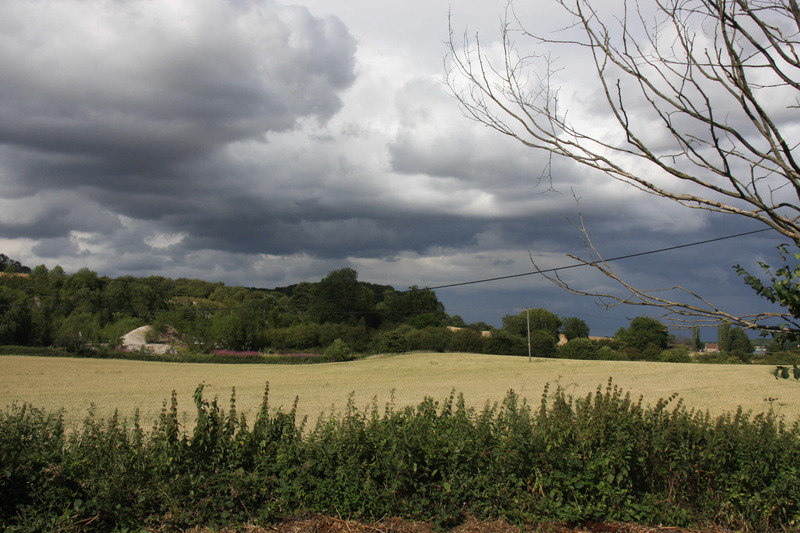 But be careful – according to a passing jogger the fields are normally occupied by some fractious horses! Ty got scared by the jogger and refused to walk past her (she was petite and totally non-threatening!) – he backed up to what he felt was a safe distance and wouldn’t come to us – luckily the jogger kindly waited for us to catch him before she moved on otherwise he’d still be there! We had contacted BW a few days ago to ask about where we could leave the boat for 5 days. Sadly we didn’t get an answer until we arrived home, and then the mooring officer had been confused and referred us to the BW moorings auction website! 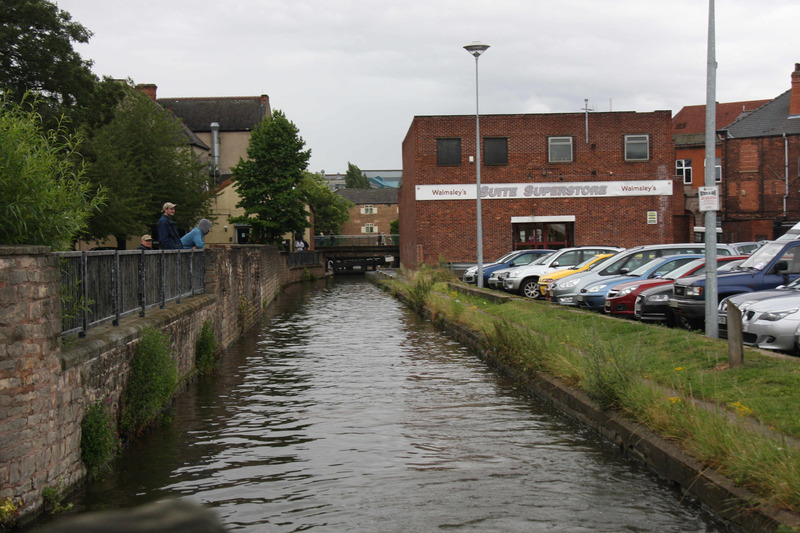 So we had to use our own judgement – we couldn’t stay on the bollards – they’re only 24-hour, but the Albert Dock moorings didn’t appeal, and the towpath was generally too overgrown. 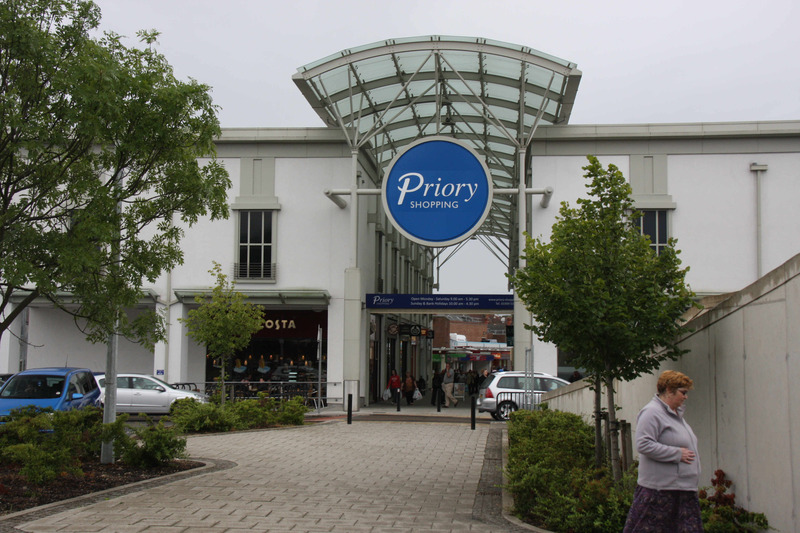 The alternative was to lock back down to Shireoaks – a trip of several hours which would make us very late getting home to Surrey. Our decision was made when it started to rain – we’d stay put, but turned the boat around, put the back onto the last mooring bollard, the middle into the vegetation and tied the front to the edge of a convenient stretch of towpath that had been mown for anglers (there was still room for them – honest!). It took a while to pack the boat for our journey home – not only did the boat need a good clean after a week’s occupation but we were extremely reluctant to leave. 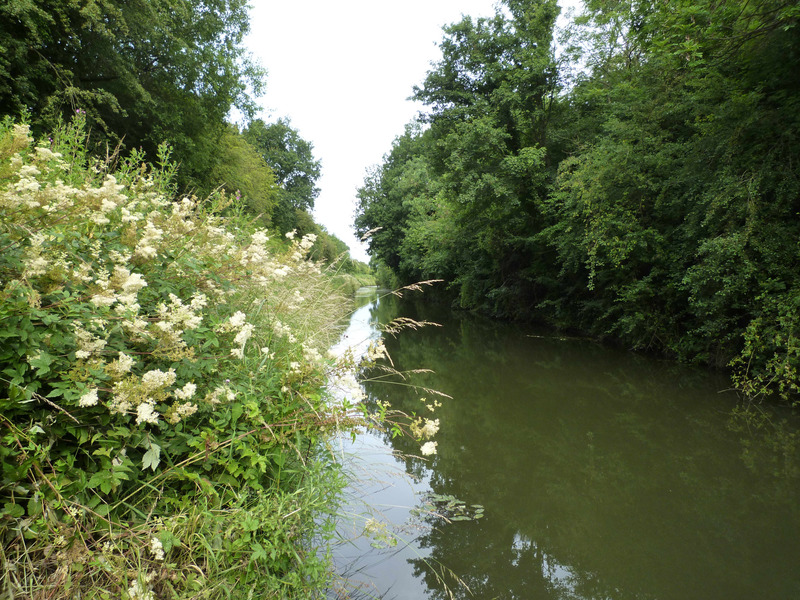 The Chesterfield Canal is a unique and wonderful navigation – it has become my second-favourite waterway – a whisker behind the river Thames. 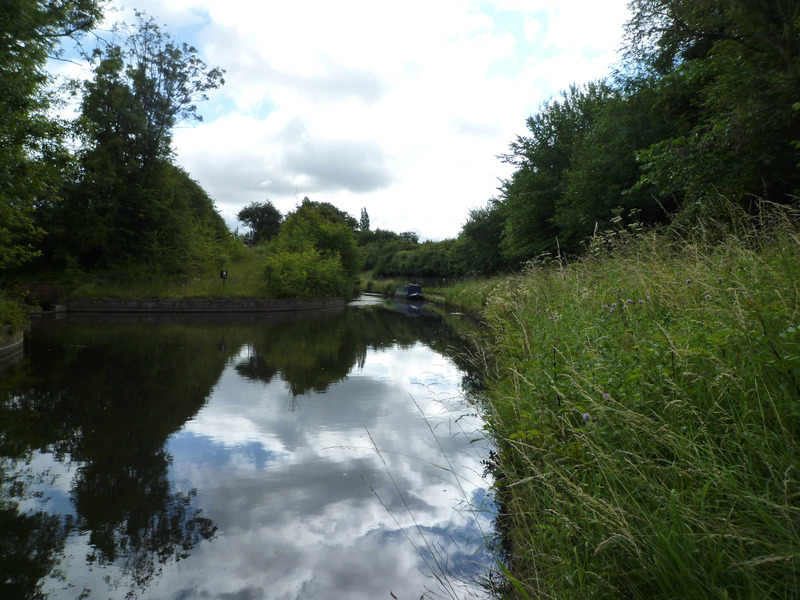 As we packed, the air was full of the freshness of wild mint, gently rubbed as we brought the boat in to moor. In the distance the mellow sounds of the brass band competition at Kiveton Park filtered through the trees. 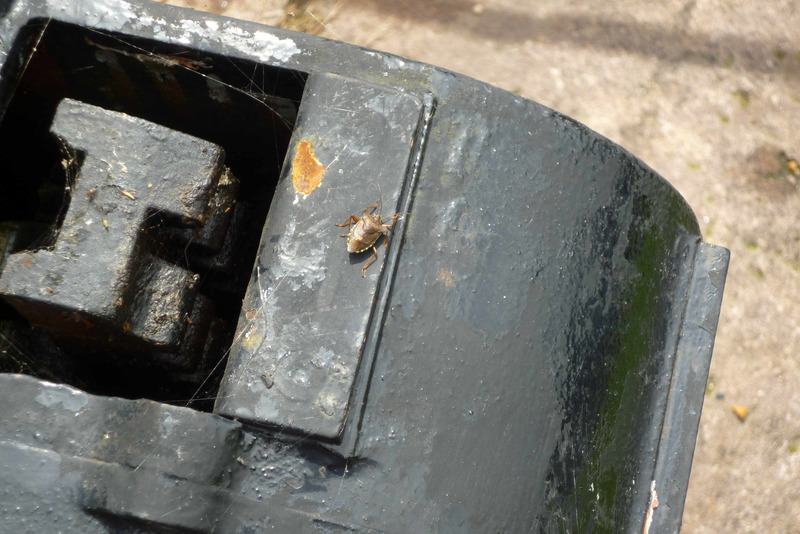 We had lunch on board and finally set off for home -we’d had the most amazing week’s cruising and discovered some magical waterways – the Trent and the Chesterfield – put them on your “must do” list…..
Oy, Mr bug, are you helping with that paddle or are you just going to sit there? Limehouse lock - but not as WE know it!